SILIGURI, October 29: Manav Thakkar from the PSPB Academy and Andhra Pradesh’s Naina were crowned in the Sub-Junior Boys and Girls sections, respectively, at the National Ranking (East Zone) Table Tennis Championships which concluded at the Municipal Stadium here today. SILIGURI, October 28: Top eight players, who were given direct entry into the main draw, based on their current rankings, in the Sub-Junior Boys and Girls sections, respectively, were joined by the group leaders as the qualification phase in the National Ranking (East Zone) Table Tennis Championships ended here at the Municipal Stadium today. SILIGURI, October 27: Anthony Amal Raj, in the best form of his live, outplayed national champion Soumyajit Ghosh 4-2 to win the men’s singles crown at the National Ranking (East Zone) Table Tennis Championships here today. 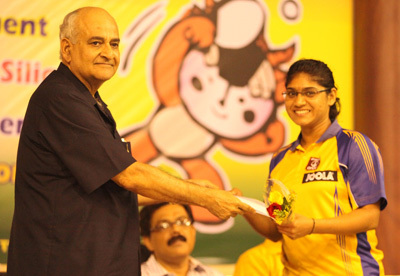 Earlier, Madhurika Patkar defeated Mouma Das 4-0 to win the women’s singles title. SILIGURI, October 26: Some top seeds in the business, including reigning woman national champion K. Shamini, muddied their reputation somewhat and exited from the National Ranking (East Zone) Table Tennis Championships at the quarterfinal stage here today. SILIGURI, October 25: All the top women seeds set the ball in motion by entering the next round at the National Ranking (East Zone) Table Tennis Championships at the Municipal Stadium here today. As expected, the qualifiers had to suffer the brunt of their fancied opponents in the main draw of the women's singles, falling by the wayside in one-sided first round matches.